Picketing at Universal today was boisterous not to mention noisy: trucks and cars loudly honked in support. 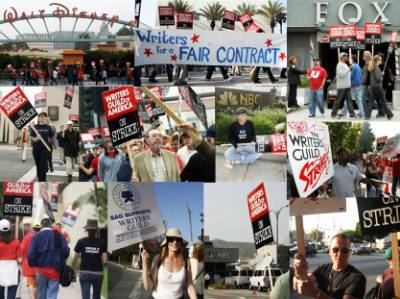 Several members of SAG joined WGA lines including Frances Fisher, Justine Bateman and Marg Helgenberger and walked for many hours. Showrunners like Desperate Housewives‘s Marc Cherry, Frasier creator Peter Casey, Drew Carey creator Bruce Helford and CSI‘s Carol Mendelsohn were out there, too. Ahmet Zappa drove by and dropped off dozens of coffee drinks. Gifts of dozens of pizzas came from Joss Whedon fans and CSI production offices. Also, Patric Verrone and David Young made stops on the Uni picket lines giving strikers updates on the negotiations. For the absolute latest, visit Nikkie Finke’s Deadline Hollywood Daily. Strikes became important during the industrial revolution, when mass labour became important in factories and mines. Most western countries partially legalized striking in the late 19th or early 20th centuries. Some states, such as Michigan, Iowa or Florida, do not allow teachers in public schools to strike. Workers have sometimes circumvented these restrictions by falsely claiming inability to work due to illness — this is sometimes called a “sickout” or “blue flu.” The term “red flu” has sometimes been used to describe this action when undertaken by firefighters. More on strike action at Wikipedia.org. previous post: Spice Girls. Friendship Never Ends. 48 queries in 1.276 seconds.